Your browser does`t support to paly this video. Please update your browser. Or cantact us via info@colasoft.comto requst it. Capsa, a portable network performance analysis and diagnostics tool, provides tremendously powerful and comprehensive packet capture and analysis solution with an easy to use interface allowing both veteran and novice users the ability to protect and monitor networks in a critical business environment. Capsa aids in keeping you assessed of threats that may cause significant business outage. Capsa is a portable network analyzer application for both LANs and WLANs which performs real-time packet capturing capability, 24x7 network monitoring, advanced protocol analysis, in-depth packet decoding, and automatic expert diagnosis. Capsa's comprehensive high-level window view of entire network, gives quick insight to network administrators or network engineers allowing them to rapidly pinpoint and resolve application problems. With the most user-friendly interface and the most powerful data packet capture and analysis engine in the industry, Capsa is a necessary tool for network monitoring. Capsa Enterprise is designed for small business as well as enterprise users and performs network monitoring, troubleshooting and analysis for both wired & wireless networks including 802.11a/b/g/n. Whether you're a veteran with years of experience or new to network monitoring, if your requirements are to identify, diagnose, and solve network problems quickly, or monitor user activity on your network, or you just need to ensure that the corporation's communications assets are safe, Capsa Enterprise is a must have network management tool. Real-time packet capture as well as the ability to save data transmitted over local networks, including wired network and wireless network like 802.11a/b/g/n. Identify and analyze 1500 protocols and sub-protocols, including VoIP, as well as network applications which are based on the protocol analysis. Easy to use Overview Dashboard allows you to view network statistics at a single glance, allowing for quick interpretation of network utilization data. E-mail and instant messaging traffic can be monitored and stored, helping identify security and data handling violations. Suspicious hosts can be detected and diagnosed enabling you to pinpoint network problems in seconds. Map the traffic, IP address, and MAC of each host on the network, allowing for easy identification of each host and the traffic that passes through each. Capsa Enterprise is the most robust packet sniffer and packet analysis application available. Capsa's Overview Dashboard and drill down functionality make it easy enough for a SOHO Network Manager but powerful enough for a Distributed Enterprise Network Engineer. By capturing and analyzing VoIP calls and displaying results, IT staff could baseline and troubleshoot VoIP-based networks. By sending an emails or play sounds, when an alarm is triggered. It helps to run packet capture and analysis at pre-defined time automatically, which can be scheduled to run one time, daily or weekly. TCP packets reveal information to troubleshoot slow network, like slow website response, CRM transactions and downloading, etc. Accurately detects DoS (DDoS) attack, Worm activity, ARP attack, TCP port scanning and suspicious conversation and locates the source and target in real-time. 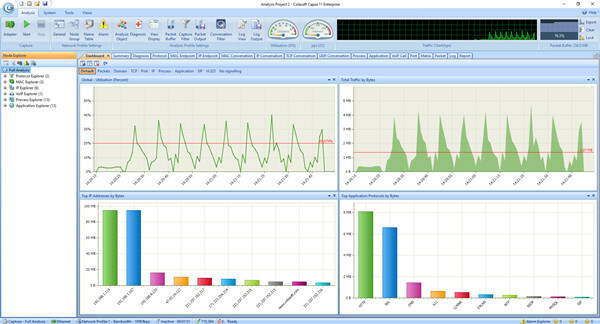 Monitors Network traffic and Network bandwidth details in graphs and numbers. Being able to support more than 300 protocols, Capsa make it easy to analyze protocols in network and understand what is happening. It captures all network packets transmitted on network and displays detailed packet decoding information in Hex, ASCII and EBCDIC. Monitors HTTP, Email, DNS, FTP, MSN and Yahoo! Messenger. Lists all hosts in network with details (traffic, IP, MAC, etc.). Automatically diagnoses network problems and suggests solutions. Visualizes the entire network in an ellipse, showing connections and traffic. Monitors all conversations and reconstruct packet stream. Free built-in tools to create and replay packets; scan and ping IPs. Quickly generates reports of most concerned items. Capsa will run with a NDIS 3 or higher compatible Ethernet, Fast Ethernet, or Gigabit promiscuous mode network adapter. Promiscuous mode is the ability to have Capsa take over the driver and put it into a mode that will allow it to passively capture all packets on an Ethernet wire, regardless of the address to which they are being sent/received. Colasoft has tested adapters based on Atheros, Ralink, Marvell and Intel chipsets. Other wireless cards may work with this version to the same degree that they worked in prior versions.